From Good Grief: Love, Loss & Laughter. These are just some of the comments that people hear, and a small sampling of how their grief is disregarded, after they’ve had a friend, acquaintance or family member die. The losses they have experienced don’t match the images of who and what is acceptable to grieve in our society. And it’s not just others that cause such pain. We are often our harshest critics. We internalize the conscious and unconscious messages we are fed daily and are often confused with the intensity of our emotions and reactions after a death, when our head is telling us we should not be feeling much at all. Even abusive, negative relationships can cause unexpected mixtures of emotion. Though we may have separated ourselves from the individual, and learned how to fend for ourselves or are still in contact, there is usually some deep feelings of loss over the years that they were not the parent or partner we had wished for. The realization that they have died can also awaken the fact that the opportunity for them to change or be different has died as well. Whether as a friend, lover, roommate or relative, living in the same household is one of the most intense experiences in our lives. It’s where we learn how to interact with others and provides daily reminders of our differences and similarities. Whether two people living in the same household have their arrangement sanctioned or accepted by others does nothing to diminish the powerful lessons and connections that develop. We are intimately shaped, both good and bad, by those with whom we live. The longer someone you know lives, the harder it can be to accept the reality of their death. Even though you may have had time to prepare and say, and do what you needed or wanted to, it can still seem like it came too soon. There are times when no matter the person’s age, you want them to stay forever and their death is devastating. There are times when those you expect to be of help are not always able or willing to do so. For some, it is too painful. Others find it impossible to stop judging long enough to listen. When you can’t attend the funeral or memorial, due to the deceased’s family, distance or other circumstances, create your own ritual or ceremony of leave-taking. Invite those who will be present with you and share your loss. 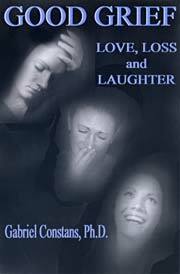 Further reading and support at: Good Grief: Love, Loss and Laughter. My son Blair was murdered with a gun on his way home from school. He was riding a Chicago city bus, and he was caught in the crossfire of a gang shooting just a few days before Mother’s Day. Newtown, Connecticut doesn’t look a lot like the South Side of Chicago. But when I hear the stories of Newtown families, I am familiar with their pain. One month has passed since the heartbreaking mass shooting that took the lives of twenty first-graders and six adults. No community should have to go through that kind of terror, and no parent should have to feel so much loss. Please join me and the families of other gun violence victims in saying: ENOUGH. We recorded a new TV ad to Demand A Plan from our leaders in Congress. Take a minute to watch the ad and call your members of Congress RIGHT NOW. Today, more than forty mayors across the country organized events with law enforcement officials, faith leaders and survivors of gun violence to commemorate the tragedy at Newtown and demand action from our elected leaders in Washington. More than a million people have signed the Demand A Plan petition calling on President Obama and Congress to step forward with a real plan to end gun violence. I’ve met parents and loved ones of gun violence victims from all across the country. We share a connection because of the pain we’ve all been through, and we can offer each other some comfort and understanding. But there’s nothing that would make us happier than never adding a new member to our group ever again. Thirty-three people are murdered with guns every day in America — sons and daughters, brothers and sisters, fathers and mothers. We’ve had ENOUGH and it’s time for our leaders in Congress to act. Father Knows Best was a show from the late fifties, that portrayed the father as someone who always had the answers and wisdom for life’s lessons and problems. He freely shared his insight when asked and it was of course, always right. In later years, The Cosby Show had a similar father figure, though he could also make you laugh. In my experience, I’ve never had all the answers, known what to do (for sure) or imparted any great wisdom to our children. I’ve tried to be the best example I can, but it seems to be an ongoing education that continues regardless of their age or circumstances. First, our oldest daughter moved out. The next to oldest daughter left soon after. Then, our first-born son went his way and his older brother followed suit. There is one remaining at home. He just graduated and starts community college this fall. Our oldest daughter and her wife, who lives just 1/2 mile away, had a beautiful baby daughter a few months ago. Her childhood friend (who we have known for almost 2 decades) just had a little boy a week before that and we’ve gladly offered to babysit. Our daughter and her husband, who lives in Seattle, have an amazing 2 year old son. Then, there are our friends who are in the process of adopting a brother and sister (5 & 7), who they have foster cared for almost 2 years, whom I also love to support and spend time with. And two of our 3 sons plan to have children some day. When it comes down to it, we haven’t “lost” anybody who has left home, but only gained more wonderful beings to the family and increased the amount of love and care to go around. Completing the circle, are all the wonderful children at the ROP Center for Street Children in Rwanda and those there caring for them. I’ve known I wanted to parent children since I was sixteen. It looks like my wish has come true 10 fold and will always be a part of my life until my last breath as a human. Sure, I love my wife and our time alone and being able to do things we couldn’t always do when children were living with us 24X7, but it is also an awesome and wonderful responsibility to support, perhaps guide and nurture other precious beings and make a difference in their lives and hopefully, their hearts. I know I rarely know anything or have any answers like the Dad’s on those old TV shows, but that’s doesn’t matter. I’m OK with not knowing or being perfect and hopefully they are too.